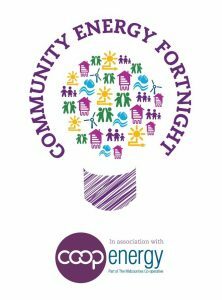 Community Energy Fortnight kicks off tomorrow, Saturday June 23rd, with over 150 events taking place across the country (see the Community Energy Coalition website for full details). We’re bringing together a clutch of energy experts for an evening of informal discussion, debate and advice on energy issues, over a tea or coffee (or something a little stronger if you prefer). If you’ve got questions about renewable energy or insulating your home this is a great chance to talk them through. We’ll also be discussing what could be done more widely in York, and throughout the evening we will be drawing up a wishlist of policies to send to our MPs as part of the ‘Speak Up’ week of lobbying on climate change organised by the Climate Coalition. James Newton works with Native Architects and is chair of Yorspace and a champion of natural building materials and community solution to housing and energy issues. Help spread the word – click to download the poster for the event. 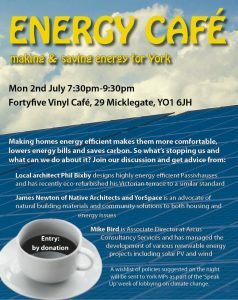 And of course, members of York Community Energy will be on hand to share what they’ve learnt in the course of developing a community energy project for York. Facilitating the event and helping us collate our ‘Speak Up’ manifesto will be our resident master of ceremonies, Anthony Day, presenter of the “Sustainable Futures Report” podcast. A copy of this manifesto wishlist will then be sent on to both of York’s MPs, Rachael Maskell and Julian Sturdy, who will each also be asked to sign the Climate Coalition’s cross party letter calling for net zero emissions. Entrance to the event is by donation on a ‘pay as you feel’ basis. Reserve your place using Eventbrite.